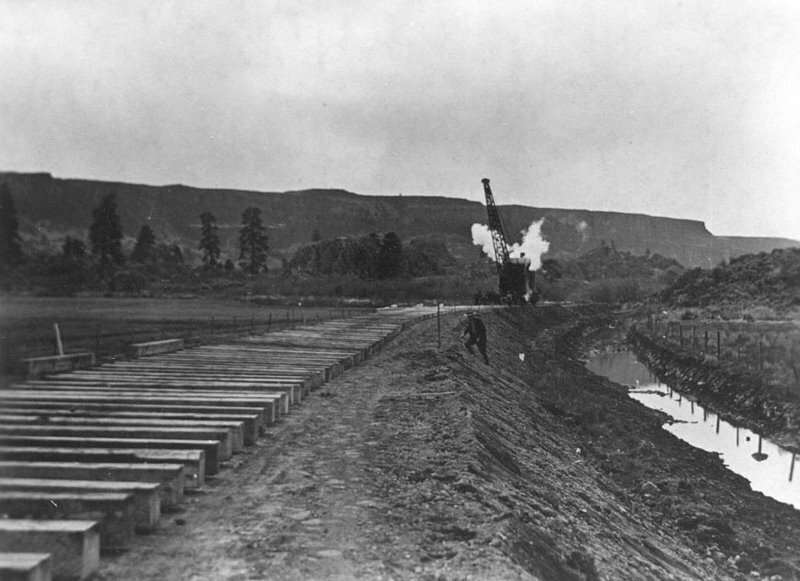 Construction of the line in the upper Grand Coulee. Here is more or less the final draft of the US Construction Railroad between Odair and Grand Coulee Dam to be used for the Grant County Centennial. J.T. Derrig, assistant to the chief engineer of the Northern Pacific railway, will leave today for St. Paul, after having completed his report on a survey of a proposed Northern Pacific branch from Coulee City to the Grand Coulee dam site on the Columbia River. He said the surveyed line is direct and ideal as to grade. It goes from Coulee almost as the crow flies to Grand coulee and follows the coulee to the banks of the Columbia. The survey is complete, he said, except for minor adjustments. The new branch will connect with two Northern Pacific branches at Coulee, one from Spokane, the other from Connell. Mr. Derrig said, “While I realize there are some problems to be surmounted before major work starts on the dam, the Northern Pacific is making an effort to have its survey in shape to meet government requirements. Nov. 6, 1933, the NP petitions the ICC to build the line from Odair to the dam site. The interstate commerce commission yesterday authorized the Northern Pacific railway to construct a line to the site of the Grand Coulee dam from its branch near Coulee City. the road is now in a position to start building the line as soon as an agreement can be reached with the United States reclamation bureau on the share of freight incidental to the construction of the dam that will be sent over the rails. “I think the bureau is ready to enter into a contract with the railroad for the heavy freight to the dam,” said James O’Sullivan, secretary of the Columbia Basin commission yesterday. Charles Donnelly, president of the Northern Pacific, after inspecting the route to be followed by the railroad last November told the Spokesman-Review that the line would be built if his company could be assured the bulk of the business incidental to the construction of the dam. This can be controlled by the reclamation bureau because the materials to go into the permanent structure of the dam will be purchased by the government. The contractors will be required to furnish their own equipment and everything that will be taken away after the dam is completed. The government will probably purchase the form lumber. “A point being considered by the railroads is the enforcing of the government’s right to a 50 per cent reduction in the freight rate over the Northern Pacific line,” said Mr. O’Sullivan. “When the original land grants were made to the railroad, the government stipulated that all its shipment should be carried at a reduction of 50 per cent in the freight rate. This will mean a reduction in the revenue on the Grand Coulee line from $6,000,000 to $4,500,00, the Northern Pacific estimates. The cost of building the line will be approximately $750,000. An estimated net income of $4,160,000 to the Northern Pacific railroad over a four-year period was predicted today in the interstate commerce order granting the railroad permission to build a branch from Coulee City, Wash., to the site of the Grand Coulee Dam on the Columbia river. The estimate was based on the supposition that the railroad would handle all of the freight for the dam, although the commission refused to order a monopoly in giving its permission. The commission’s order said it would cost $759,000 to build the 28 1/2 miles of line, which must be started by May 1 and be completed not later than November 1, this year. Senator Clarence C. Dill said the commission refused to recognize conditions the railroad had interposed in its application that it wouldn’t be required to build the line unless assured the dam was to be built; that it wouldn’t be required to build unless it was given all of the hauling of dam supplies and that it be permitted to abandon the line after the dam is completed. The senator said the first condition was disregarded because the commission ruled there was no question but that the dam was in early stages of construction, excavations being made at the site. The second condition, he said, was not granted, the commission taking the stand that it was up to the railroad to obtain the business as best it could, and the third was not acted upon because the commission ruled and application to abandon should be made after the dam is completed. Dill said the commission was acquainted with the plans for ultimate building of the Grand Coulee to a height of approximately 375 feet and that its action was influenced by the possibility of need for the railroad within the comparatively near future for that purpose. Last-minute discovery that the 12 bids for the Coulee City-damsite railroad had been prepared on erroneous estimates necessitated postponement of the openings, scheduled for Thursday morning, until 3 o’clock in the afternoon in the Civic building auditorium. Findings by the Northern Pacific railway engineering staff shoed that the rock tonnage estimates along the 30-mile right-of-way were far too high. Frank A. Banks, construction engineer, in deferring the meeting until the afternoon, announced that the bids would be compared on a rescaled basis. The 12 construction firms competing for the award are: Guthrie & McDougal, Portland; Winston Bros. Co., Seattle; Sharpe & Fellows, Los Angeles; Foley & Lawler, Butte; Morris & Kundson, Spokane; Caluccio & Co., Seattle; Clifton & Applegate, Spokane; Myers & Goulter, Seattle; David H. Ryan & Co., Almira; L Romano Engineering Co., Seattle; Crick & Kuney, Spokane, and P. C. Crooks & Co., Portland. The David H. Ryan company buildings at the Grand Coulee dam site are being moved to the city of Coulee, preparatory to starting work on the railroad, according to James O’Sullivan, secretary of the Columbia Basin commission. Ryan, who was awarded the railroad contract, is expected to start operations Monday. Wooden ties arrived this week. Possibility of saving between $1,000,000 and $3,000,000 by construction and use of a branch railroad line by the government from Coulee City, Wash., to the Grand Coulee dam site on the Columbia river was seen here today by Senator Dill. “There was some discussion of the contractor for the dam building the line, but it appears now that it will be a government project,” he added. It was feared the contractor might be delayed in obtaining financing of the road. The line will be of no use for the transportation of gravel and sand, the senator said, as that material probably will be obtained about five mile up the river from the dam site. Dill predicted a definite decision on the railroad problem would be made within a short time. The ballast crew on the new railroad from Coulee City to the dam probably will have its work finished in a few days. The crew is now working beyond the town of Osborn, some 25 miles north of Coulee. The last mile of steel of the U.S. Construction railway, from Coulee City to the dam site, is being given finishing touches this week by Contractor David H. Ryan. If the present progress continues, the route may be completed by the end of the week. The entire railroad to the Osborne canyon, and the first unit of the MWAK connecting link, may be finished by the latter part of June. Tracks remain to be laid from the old Crick & Kuney operations to the Osborne canyon, and from there through the tunnel, now being bored, and across the river and along the east shore. Heavy concrete equipment, east shore sheet piling and cement will be shipped in over the completed line. It is expected that the MWAK railroad bridge, which will serve as a highway crossing, will be opened to traffic by the middle of next week. Borrowing an army phrase, Odair, four miles east of Coulee City, will become the railhead of the Grand Coulee project. At Odair, the new 30-mile railroad through the coulee to the dam site will connect with the Washington Central. Thousands of tons of materials and machinery will be handled through this junction. The whistle of locomotives will be heard in the Grand coulee for the first time in history. President Roosevelt will leave his special train at Ephrata, instead of at Soap Lake, when he visits the Coulee dam next Saturday. W.R. Jarrell, Seattle, head of the federal secret service in the state of Washington, wired James E. McGovern, reception chairman here, this morning informing him of the change. Colonel E.V. Starling, head of the White House secret service in charge of the president’s trip, said in Spokane last Saturday he had recommended the change, after he discovered the platform at the Soap Lake station is only 150 feet long. To avoid making most of the passengers on the train detrain in the sagebrush, the schedule has been revised, with the approval of Marvin McIntyre, the president’s secretary in Washington. Times previously announced for the president’s visit to the dam site, his speech, and departure of his train will not be affected by the revision, Mr. McGovern said. His automobile round trip will be 10 miles longer. He will travel east on the North Central highway five miles to Soap Lake, and there turn north to go through the lower coulee as already scheduled. His train will be backed to Wilson Creek, 23 miles east of Ephrata, to turn it around after he leaves for the dam, Great Northern officials said. From there it will be returned to Ephrata in time to pick the party up and get to Spokane by 6 p.m. The president will be greeted by Sam Mason, president of the Silas Mason company, as official representative of the construction companies which will build the dam. Silas Mason, chairman of the board of the firm, sent this notification to James O’Sullivan, secretary of the state Columbia basin commission here today. Sam Mason now is at Fort Peck, Mont. The loud speaker system will carry Roosevelt’s speech to the audience of thousands expected to gather at the dam will be installed Wednesday. PRESIDENTIAL TRAIN IS DUE HERE 1 A.M. Many Spokaneites plan to be on hand at the Great Northern depot at 1 a.m. Saturday to catch a glimpse of President Franklin D. Roosevelt. The president’s train was scheduled to leave Bonneville at 4:15 p.m. Friday. A large delegation of Washington officials boarded the train at Portland Friday to accompany the president to Spokane and the Grand Coulee dam site. The train will arrive here at 1 a.m. It will be switched to the Great Northern railroad yards. It is scheduled to leave Spokane for Ephrata at 1:30 a.m. The weatherman’s prediction for rain will not keep large crowds from appearing at the depot to catch a glimpse of the president, it was indicated. This sparsely-settled section of the Inland Empire prepared to welcome President Franklin D. Roosevelt Saturday to the site of the $63,000,000, which may transform it into a productive agricultural and industrial district. Workmen rushed to completion the speakers’ stand of the “Green Bowl,” natural amphitheater adjacent to the dam site, where the president will deliver an address about noon Saturday. The bowl will furnish space for nearly 40,000 persons. President Roosevelt will leave his special train at Ephrata about 9 a.m., Saturday, viewing a display of mid-Columbia products before leaving for the dam site. He will make the 55-mile trip in a limousine owned by the Seattle police department and driven by Traffic Officer Otto Cameron. The executive will inspect the dam site with officials of the reclamation department before his address. Roads leading to it will be closed to general travel. Among the privileges of the “Queen of the Columbia,” the young lady who will officiate at the driving of the golden spoke marking completion of the Grand Coulee construction railroad, will be to pull the throttle of this ancient “coffee pot,” the darling of Contractor Dave Ryan’s heart. The old monarch of the rails was victor over many a logging camp mountain grade in the years before it was moved to the Grand coulee. Mr. Ryan is seen standing in front of his pet, while the engineer and fireman are dolling her up for the next run. The “Queen of the Columbia” and Senator C.C. Dill will take the first whacks at the Paul Bunyan spike on December 1. It’s the golden spike for the United States Construction railway into the Coulee Dam site, and its driving will mark the end of an important chapter in the building of Washington’s greatest project. Towns throughout the basin area and adjacent to the area are entering princesses in the “Queen of the Columbia” contest being managed by the (Spokane) Chronicle at the request of the American legion post at the Coulee Dam. The most beautiful of all the girls of the Columbia basin area will be chosen to preside over the driving of the golden spike in the new government railway, leading from Coulee City to the dam site. The Chronicle, at the request of the Coulee dam post of the American legion, will undertake to find the queen of youth and beauty and to crown her on the day of the completion of the railroad. David H. Ryan, builder of the Coulee line, announced today that he expects to finish the construction by December 1, when the ceremony of driving the golden spike will be held at the junction of the Ryan road with the Crick & Kuney line, at the head of the coulee. Major Fred Weil, chairman of the American legion state employment committee, and an official of the Coulee dam post, today informed the Chronicle that the legion is making elaborate plans for entertainment of the visitors on Golden Spike day. The Chronicle will send invitations to each city and town in the Columbia basin area to enter a candidate for queen. Final judging will take place in the new Roosevelt theater at Coulee Center. These two young ladies are playing important roles in the princess contest being conducted at Sprague as a preliminary to the Queen of the Columbia contest at Grand Coulee, Saturday, December 8, as a preliminary to the driving of the golden spike in the United States Construction railroad. Margaret Boehl (right) was leading in the balloting Friday evening, while Mary Alice Hertrich (left) was in striking distance of victory. Irma Taylor is a third contestant. Balloting was to close this evening. Speed has marked the laying of ties and rails for the United States construction railway up the floor of the Grand coule, the completion of which will be marked by a gold spike driving celebration Saturday afternoon. The work has been expedited by this huge track-layer outfit, which was photographed in operation a short distance from the head of the coulee Wednesday. History in the making is pictured here. At Grand Coulee Center, on Saturday, a large crane, barely showing in the background, dropped the final rail of the Grand Coulee railroad into place and a half dozen rather gentle taps with a hammer drove the golden spike into place. Had Governor Clarence Martin, United Stated Senator C. C. Dill, Contractor David Ryan, Cheney Cowles of the Spokane Chronicle, or others who handled the maul, struck a full blow on the golden head, the “driving” ceremony would have been complete, but they all did their hit and the spike went home with a thud into the solid body of the brand new tie. Mr. Cowles is pictured as he swung his blow. Members of the royal court are about him. At the left in the picture, in the legionnaire cap is Al Meyers, who just a short time ago promoted the democratic victory banquet in Spokane. There will be no passenger trains running from Coulee City or Odair to the dam site, Colonel M. J. Whitson, vice president of the MWAK, said yesterday. Reports to the contrary, that workmen and others would be transported back and forth via railway, have been here for the past few weeks. As the railroad, technically known as the United States Construction railway, is under supervision of the United States government, with the MWAK only operating the trains over it for the hauling of supplies, there is no possibility of the company going into the transportation business, Colonel Whitson said. peak. The structure is of the double-deck type, although traffic will be carried only on one deck. Both rail and highway traffic will be routed over it. The relocation of the railroad in the well-known slide area will be completed by David H. Ryan in about three weeks, progress indicated yesterday. The big job of removing some 375,000 cubic yards of earth and lasting loose some 11,000 cubic yards of rock is progressing rapidly. The United States construction railway line from Coulee city to the dam site, about 30 miles long, will be completed this week as far as the Ryan office. Ryan will start work soon laying steel from the ed of the line near his office to a point where the railway and highway grade is being widened by the MWAK, just a few yards upstream from the axis of the dam. He will also lay steel at the other end from the point where the MWAK is drilling a tunnel through the granite to and past the slide area. As soon as this work is completed, the small link remaining will be built to connect both ends of the line. Work in the tunnel should be completed in a month’s time, and as soon as this is finished, steel will be laid to the bridge and across on the east shore. It is expected that the first locomotive will steam along the line within two month’s time. With about 30 feet to go, the railway tunnel, back of Administration city, is almost complete. Work on the tunnel began last fall. The last part has been drilled through but must be enlarged. With 50 or so cars of materials and equipment arriving daily at the dam, once concrete pouring is well started, provision for handling much of that heavy work was necessary and a huge gantry crane has been set up at the railroad yards at Coulee Dam City, a mile up the coulee. There the trains will be sidetracked and unloaded and the material sent down the grade to the dam site. Eventually there will be four of the big cranes in operation. They are nearly 20 feet high and straddle the rails. Flat cars are pushed under the cranes, which pick up the materials and unload them. The cranes are mounted on wheels to permit shifting from place to place. Nine cars, loaded with 34 mammoth concrete buckets, are standing in the yards, waiting for the day when they will be put into service carrying the mixture from the mixing plants to the waiting forms. The railroad yard is becoming one of the busy spots of the area, with the erection for small checking offices, sheds and several lines of cars on sidings. The first carload of cement will be sucked into the silos of the MWAK company's steel storage tanks west of Grand Coulee dam site this afternoon. Seven or eight cars are to be pulled out of Odair this morning, hooked up with cars of other freight. Five cars are from the Metaline Falls plant of the Lehigh Portland Cement company, ant three from Coast plants. From now on cement is to move to Grand Coulee dam site in increasing volume, starting at around 38 to 40 cars per week. Of this total, six or seven a week will go from Metaline falls; three or four a week from the Irvin plant of Spokane Portland Cement company, and 30 cars from Coast plants. The MWAK company is not ready to pour concrete, but will fill the silos in preparation for the first pouring. These silos have 40,000 barrels capacity, or 160 carloads of overage 250 barrels each. The Northern Pacific is preparing to run two cement trains a day to the dam site after January 1, when pouring will be under way on a large scale. Fourteen carloads of cement arrived last Thursday and were unloaded late in the afternoon. From now on two cement trains a day will be run from Odair, where the U. S. construction railway joins the Northern Pacific. An oil-burning Shay that backs down a 5 per cent grade has a great part in moving and re-moving the 162,000,000 net pounds that had come in by rail by April 1. This means a gross tonnage of 290,000,000 pounds for 2087 cars used. A locomotive makes daily trips from the main line at Odair, 31 miles away, to Electric City. The low-geared shay continues the additional five mile to the government warehouse by swinging wide about curves and long the cutbacks of high abutments. From the cement silos to the warehouse yards is two-miles-about 4000 feet as the crow might fly. Up and down this grade, the shay creeps along at the rate of from eight to 10 miles per hour. This gear-driven engine is used in place of a road locomotive because the steep grade requires it. Since first use of the shay, July 23, 1935, the month of March has taken over a lion’s share in monthly railroad work as 23,641 net tons, or 48,316 gross tons, came into Electric City on 530 cars and 561 empties were returned. The tonnage for March is four times the 550-ton average for each month of railroad operations in 1935. January and February are next high in order with 16,077 and 14,380 tons. More than tow-thirds of the weight by rail has been brought in during the three months of 1936. The explanation lies in the present increased cement shipments of 25 cars daily, with 72,000 pounds per car net; the 3,000,000 feet of timbering arriving during the last two months and the 187 carloads of steel for the concrete-carrying trestles. The 2087 carloads brought in meant 962 cars of bulk cement for the cement silos, and 1125 of miscellaneous, such as timber, steel and explosives. Cement itself, both bulk and sack has reached 70,000,000 since the beginning of work here. The 120,000 net tons that have passed over the railroads represent 55 per cent of all tonnage checked by the company warehouse. And yet of more than 21 months of receiving material, the railroad has been in operation but eight. The railroad system was constructed by David H. Ryan. It is operated by the MWAK company. Governor Clarence D. Martin piloted the first official train over the line last July 29. In 1936 an employee of MWAK (Mason-Walsh-Atkinson-Kier Company) was killed when run over by a train hauling a flatcar "loaded with buckets of concrete". Contractors Crick & Kuney were to complete the trackage and roads at the dam site by the end of the month. All other materials furnished by the Government will be delivered to the contractor f.o.b. cars at Odair, Washington. The Government has constructed a siding on the Government construction railroad at the head of Grand Coulee, of sufficient length to provide for unloading and storing equipment to be installed by the Government and has installed a gantry crane of sufficient capacity to handle the heaviest pieces required. All additional sidings and spur tracks at the head of Grand Coulee, required for unloading and storing materials delivered to the contractor at Odair, Washington, shall be constructed by and at the expense of the contractor. A railroad for use in transporting construction materials to the dam site has been constructed by the Government, extending from its junction with the Northern Pacific Railway at Odair, Washington, to the dam site, a distance of about 30 miles, as shown on the location map. 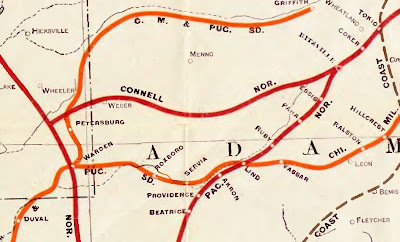 The railroad is standard gage, of substantial construction, and consists of a single track, with no siding, passing, or spur tracks, except for the delivery yard at Odair, one passing track at the head of Grand Coulee, a spur track to the gantry crane, side tracks at the cement unloading and blending plant, and a side track to the Government warehouse and storage yard. The railroad will be turned over to the contractor by a written order from the contracting officer, and upon the receipt of such written order, the contractor shall immediately accept the railroad and assume its operation and maintenance. The contractor shall construct at his own expense or purchase from the previous contractor, all additional siding, passing, spur, and switching tracks and wyes required for his operations, shall furnish and install, when and where directed by the contracting officer, a complete switch layout for a spur track to the field fabrication plant of the contractor for furnishing the penstocks and pump inlet pipes, and shall furnish all necessary rolling stock and other equipment require for the operation and maintenance of the railroad. The contractor shall operate and maintain the railroad and shall haul and handle all materials delivered to the contractor by the Government as provided in paragraph 29 for use in the construction of the dam, powerhouse, and foundation for the pumping plant, and the entire cost thereof shall by included in the prices bid in the schedule for the items of work in the performance of which the railroad is used. The engines used by the contractor shall not be heavier than 200 tons and carloads shall not be heavier than 300,000 pounds: Provided, That for infrequent loads, carloads heavier than 300,000 pounds may be transported subject to the specific approval of the contracting officer: Provided further, That all materials delivered in carload lots to the contractor by the Government may, at the option of the contractor, be hauled without charge over the railroad. In addition to the materials to be transported over the railroad as above specified, the contractor shall also transport in either direction, from the delivery yard at Odair to the Government siding or field fabricating plant at the head of Grand Coulee, to the siding at the Government warehouse, or to the dam, all materials of every kind and nature required to be transported for the Government or for other contractors or agents of the Government engaged on work on any part of the Columbia Basin project. Such additional transportation service shall be promptly and efficiently handled to the satisfaction of the contracting officer, and the contractor shall be held liable for any damage to material while in the care of the contractor during loading, transporting, and unloading. The rules and regulations under which such additional transportation service shall be furnished shall be subject to the approval of the contracting officer. Payment for such additional transportation service will be made at the unit prices bid under items 177 to 184, inclusive, of the schedule. The unit prices bid in the schedule for transporting materials for the Government or its agents, other than the contractor, shall include the cost of loading and unloading such materials and, in the case of materials required to be placed in the Government warehouse, shall include the cost of placing the materials in the warehouse as provided in paragraph 29, Provided, That all materials delivered to the plant for the field fabrication of penstocks and pump inlet pipes will be unloaded by the contractor for fabricating the penstocks, and pump inlet pipes: Provided further, That all completed sections of penstocks and pump inlet pipes delivered to the contractor for transportation to or installation in the dam will be placed on the cars by the penstock and pump inlet pipe contractor, but all blocking, bracing, and ties required for safe transportation of the pipe sections shall be furnished and placed by the contractor under these specifications. The unit of measurement for payment under items 181 and 181 will be one hundred pounds and under items 180 and 182 will be a car. In making payment to the contractor for any shipment in one car, the rate will be used which will result in the lower cost to the Government. The contractor will not be paid under items 177 to 184, inclusive, for transporting any materials and equipment which are furnished to the contractor by the Government for installation or use in the work to be done by the contractor under these specifications. The previous contractor has transported and placed in the warehouse or storage yard materials for installation in the work. For such materials which are installed by the contractor under these specifications, the Government will deduct from the unit price bid in the schedule for installing the materials, the cost of transportation over the construction railroad as determined from the unit prices bid under items 180 to 183, inclusive, of the schedule. All transportation service to be paid for under items 177 to 184, inclusive, of the schedule will be ordered in writing by the contracting officer, and the unit prices bid in the schedule shall include the cost of all rental, demurrage, or other charges for railroad equipment while in the contractor's possession and the cost of returning the empty cars to the railway company at the delivery yard at Odair. In the event of any dispute or doubt as to the payment to be made for any transportation or unloading service specified herein or as to the rules or regulations applicable thereto, the matter shall be submitted to the contracting officer, whose decision shall be final. Insofar as practicable and applicable, as determined by the contracting officer, the practices and regulations current with the Northern Pacific Railway Company will be used as a guide by the contracting officer in approving regulations and deciding questions regarding them or their application. The contractor shall install and maintain all necessary crossing and warning signs and will be held responsible for the safe and proper operation of the railroad. The joint section of the railroad, being the delivery yard at Odair and a portion of the main line of the Northern Pacific Railway at the delivery yard, will be used in common by the Government, the railway company, and the contractor for delivering cars and equipment from one party to the other, but the operation of the joint section will be under the direction and control of the railway company, and before making use of the joint section, the contractor shall agree, in writing, with the Government and the railway company, to observe, so far as applicable to the contractor, the terms and conditions of the agreement between the United States of America and the Northern Pacific Railway Company, copy of which may be examined in the office of the Bureau of Reclamation at Washington, D. C., Denver, Colorado, or Coulee Dam, Washington. All operations of the contractor in connection with the railroad shall be subject to the approval of the contracting officer. The contractor shall maintain the railroad in good operating condition for the entire period during which the construction railroad is being operated by the contractor. If, in the opinion of the contracting officer, the contractor does not at any time properly maintain the railroad or any part thereof, the Government reserves the right to do any work which, in the opinion of the contracting officer, is necessary for its proper repair, maintenance, or operation, and to charge the cost thereof to the contractor. Within 10 days after the date on which the railroad is turned over to the contractor, the contractor shall inaugurate regular train service at least twice each week until the railroad is returned to the Government. If, in the opinion of the contracting officer, the contractor fails at any time to provide proper transportation service as required, the Government reserves the right to assume complete control of the railroad, to take over any or all of the contractor's railroad equipment in use on the railroad, and to operate the railroad for the purpose required by the contract at the expense of the contractor. Upon the completion of the contract under these specifications, the contractor shall return the railroad to the Government in as good condition as when turned over to the contractor, reasonable wear and tear excepted. The Government reserves the right to operate its own trains or motor cars of any nature desired, for any period of time, over the railroad: Provided, That such operation of trains or motor cars will be arranged to interfere as little as practicable, as determined by the contracting officer, with the necessary work of the contractor, and the trains shall be dispatched by the contractor. Except as otherwise provided in this paragraph, the cost of all work described in this paragraph shall be included in the unit prices bid for the various items of work in the schedule in the performance of which the railroad is used. The extension of the railroad to the left powerhouse shall be constructed by the contractor. All ties, rails, angle bars, tie plates, spikes, bolts, and nut locks will be furnished by the Government as provided in paragraph 29. Ties shall be placed 16 to the 30-foot rail and 17 to the 33-foot rail. For shorter rails the spacing shall be in the proportion of 16 to a 30-foot rail. The ties shall be placed and maintained normal to the line of the rails, and the ends of the ties on one side of the track shall be lined parallel to the rail. Selected ties shall be used for curves of two degrees or more and at rail joints, as directed by the contracting officer. The heart side of ties shall be turned down except that where ties are not straight the bow side shall be up. Ties shall be adzed where necessary to obtain even rail bearing. The ties shall not be damaged by picks, shovels, or other tools or by over-spiking. Tie hooks or tongs shall be used instead of picks. The rails will be approximately 90-pound second-hand or relay rail. In unloading from the cars, the rails shall be skidded or otherwise carefully handled. All rails shall be laid with staggered joints. The joints on one side shall not vary more than 12 inches in either direction from the center of the opposite rail. Rails of less than standard length shall be used for curves, to bring the joints in proper position. Before being laid, all rails on curves of three degrees or more shall be curved by means of an approved rail bender. Relay rails shall be matched so that the worn portions will be on the same side of the rail and shall be laid with the worn portion on the inside or outside of the track as directed by the contracting officer. Rails shall be laid with the base of the rail true to the plane of the track. The rails shall not be driven into position with a hammer, maul, or any similar tool, but shall be moved with rail tongs or lining bars. The proper allowance for expansion and laying rail will be governed by the temperature of the rail, as determined by the contractor by means of a rail-laying thermometer. The proper allowance for expansion at joints shall be secured by using standard metal expansion shims. For 30-foot lengths of rail, the shims shall be omitted at every tenth joint. The rail- laying thermometer and expansion shims shall be furnished by the contractor and shall besubject to the approval of the contracting officer. To insure proper adjustment at joints, the rails shall be brought together, with expansion shim inserted, and carefully bolted and all bolts thoroughly tightened before spiking; after which the expansion shim shall be removed. Each joint shall be supported by two ties, with the spikes in the slots provided in the angle bars. Special care shall be taken in applying angle bars. The bolts in each angle bar shall be placed with two heads inside and two heads outside of the rail. A full set of bolts with nut locks shall be used at each joint and, where necessary, holes shall be drilled in the rails to accomplish this. The inside of each angle bar and that portion of the rail covered by the angle bar shall be given a brush coat of oil before the angle bar is placed. After the joint is completed and bolts fully tightened, the outside of the angle bar shall be given a brush coat of oil. The oil for this purpose will be furnished to the contractor as provided in paragraph 29, and the necessary brushes shall be furnished by the contractor. All nuts shall be tightened by using wrenches of proper sizes to fit the nuts and bolts. Wrenches for 7/8 inch bolts shall have a lever arm of 36 inches, and for 1-inch bolts the lever arm shall be 48 inches. Joints shall not be spiked in holes in slots until after all bolts are fully tightened. All ties shall be fully tie-plated. Care shall be taken to obtain accurate gage of track, uniform bearing of the plates on the ties, and true bearing of the rails on the plates. The plates shall be set with the entire face of the shoulder in contact with the base of the rail, and in no case shall the tie plate be set with the shoulder under the base of the rail. All rails shall be fully spiked, four spikes to each tie. On curves of three degrees or more, three spikes shall be used to each rail, the extra spike being placed on the inside of the rail. A track gage shall always be used when spiking track. The standard gage of 4 feet 8 1/2 inches shall be used on tangents and on curves up to and including eight degrees. For curves sharper than eight degrees, the gage shall be widened at the rate of one-sixteenth of an inch for each degree of curve above eight degrees. The rail shall be held against the gage with a bar while the spikes are being driven. Spikes shall be started vertically and square and shall be driven so that the face of the spike will come in contact with the base of the rail. Spikes shall not be straightened while being driven, and care shall be taken not to overdrive the spikes. Angle bars shall be spiked in the slots provided for this purpose. The outside spikes of both rails shall be near one edge of the tie, and the inside spikes shall be near the other edge. The inside and outside spikes shall be spaced as far apart as the face and character of the tie or tie plate will permit, but no spike shall be nearer than two inches from the edge of the tie. After the track is laid, it shall be brought to approximate alignment before any ballast is placed. Bolts shall be gone over and retightened at short intervals and after several trains have passed over the track and before final acceptance all bolts shall be gone over again and thoroughly tightened to the satisfaction of the contracting officer. Payment for laying ties and rails will be made at the unit price per track-foot bid therefor in the schedule and for the actual number of track feet of track laid, which unit price shall include the cost of unloading, hauling, and placing all ties, rails, angle bars, tie plates, spikes, bolts, and nut locks in accordance with the specifications. No payment will be made for temporary spurs or sidings constructed by the contractor for his own use to facilitate construction work. Rail anchors shall be applied where directed by the contracting officer and in the most approved manner for the particular type of anchor furnished. Rail anchors will be furnished to the contractor by the Government as provided in paragraph 29. Payment for applying rail anchors will be made at the unit price bid therefor in the schedule, which unit price shall include the cost of unloading, hauling, and applying the rail anchors. The track for the extension of the railroad to the left powerhouse shall be ballasted as shown on the drawings or as directed by the contracting officer, and, in addition thereto, sections of the existing track near the spurs to the pumping plant shall be raised in grade by increasing the depth of ballast. All ballasting material shall be furnished by the contractor. Pit-run gravel from which all cobbles over three inches in size shall be raked may be used. The required amount of ballasting material shall be spread uniformly along the track, the track raised to the required height as indicated by grade stakes set by the contracting officer and the material solidly tamped under the ties. In raising track each jack shall be so regulated as to avoid bending angle bars or straining joints. After being raised, the track shall be aligned to conform strictly to the stakes set by the contracting officer. Each tie shall be tamped from 15 inches inside the rail to the end of the tie with a tamping bar, tamping pick, or shovel. The end of the tie outside of the rail shall be tamped first, and, if possible, a train or trains shall be allowed to pass over the track before tamping inside of the rail. No trains shall operate over the track until the tamping outside the ties has been completed. Rails that are damaged by reason of neglect on the part of the contractor to comply with these requirements shall be replaced at his expense. The center of the tie shall be tamped loosely with the blade of a shovel. After being settled by passage of a few trains, the final tamping and adjustment to line and grade shall be made and all ties shall be well tamped with tamping bars or tamping picks. During the ballasting operations, the elevation and sighting boards shall be in constant use. On curves, the outer rail shall be elevated, and the elevation tapered out on tangents at both ends, where necessary, as directed by the contracting officer. On all other portions of tangents, both rails shall be brought to the same level. After the ballasting is completed and the track is in perfect gage, surface, and line according to the stakes, the ballast shall be neatly trimmed to the section shown on the drawings or as directed by the, contracting officer and any surplus material shall be spread evenly along the slopes of the embankments outside of the roadbed section. Measurement for payment for ballasting will be made of the material in place after tamping and to the lines and grades shown on the drawings or as established by the contracting officer, and the space occupied by the ties will not be included. Payment for ballasting railroad track will be made at the unit price per cubic yard bid therefor in the schedule, which unit price shall include the cost of furnishing, hauling, placing, and tamping the required amount of material, raising and aligning the track, and surfacing as provided in this paragraph. Crews employed by Morrison-Knudsen, have begun removal of railroad tracks near the Vista House. This means the end of the famous little tourist train, forced to bow to the hand of progress in the $1,691,666 river channel improvement contract. The job involves much excavation, huge amounts of rock quarrying and placement of thousands of tons of armor rock to form adequate future protection for the banks of the Columbia River immediately downstream from Grand Coulee Dam. A necessary preliminary to the removal of the 30 mile construction railroad which delivered most of the materials for Grand Coulee Dam was accomplished when the Bureau of Reclamation opened bids for a trans-shipment building at Odair. The building will be used to transfer equipment still needed for construction at the dam from rail to motor truck facilities once the railroad is removed. The contract calls for a building, a 75-ton bridge type crane, roadway paving and work on rail facilities at the site of the building. The contract calls for completion of the work within 90 calendar days after receipt of the notice to proceed. Bids will be called later for the railroad itself. Bids will be opened August 31 at 11 a.m. for the removal of 30.7 miles of track belonging to the government railroad between Odair and Grand Coulee Dam. 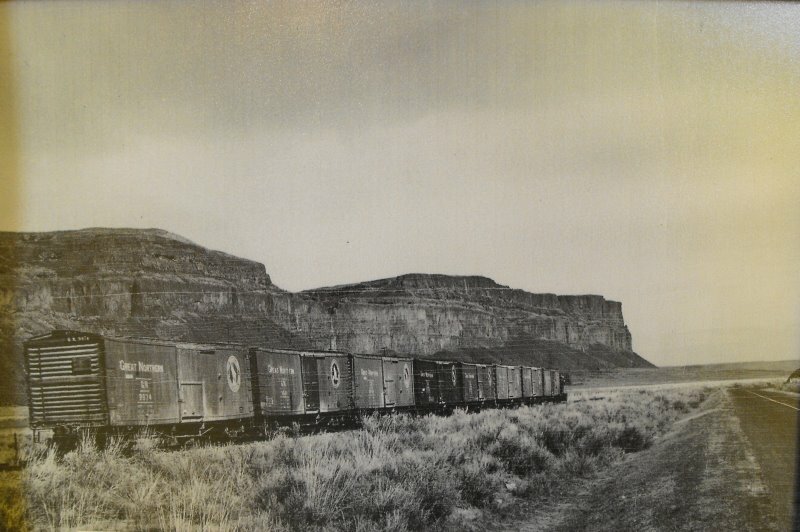 The “sagebrush special” or “gopher chaser,” as it was sometimes called, connected with the Washington Central branch of the Northern Pacific Railroad at Odair, near Coulee City. Its construction was essential in delivering millions of tons of material used in the construction of Grand Coulee Dam. 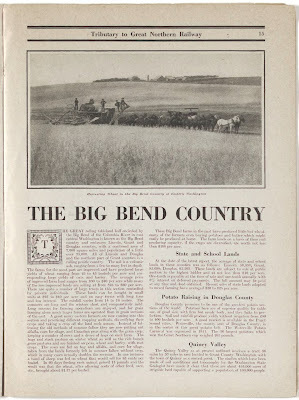 The railroad hauled more than twelve million barrels of cement, approximately 46,500 carloads for the construction of the dam; 77 million pounds of reinforcing steel, and ten million pounds of steel for the 18 foot penstocks, with feed the giant generators of the dam. At the peak of construction in the late thirties, two trainloads a day ran the 30-mile route. The biggest train was 67 cars. None of the original rolling stock is still on the line. The railroad was run from July 19, 1935, until November 16, 1942, by contractors building the Grand Coulee Dam, first MWAK and later CBI. Since then, the government has been running the road. Although no original rolling stock is left, at least two crewmen who have been here from the first still are employed. Floyd Craig, conductor, has worked here since the first spike was driven. Haskell Finch, engineer, has been here from the start of hauling. Fred A. Warren, superintendent for the government since 1944, announce plans for his retirement upon completion of the removal. Warren has been with the road since the government took over from the contractors. He was in charge of maintenance of right-of-way from 1942-1944. He succeeded Albert S. “Tiny” Hunter, a long-time veteran, as superintendent when Hunter entered the armed forces. Another veteran engineer, L.B. Denny, who was here from the beginning, passed away in recent years. Denny got his start on the government’s Alaska railroad. There has been only one serious mishap in fifteen hears, and that was not from a train running into a car, but from a truck load of lumber running into a train at the Basin City crossing. No one was injured, but two railroad cars were burned. Don Adkins, Inc., of Ellensburg is now building a trans-shipment building at Odair to transfer freight from rail to truck at that point, to handle future freight needs at the dam. A 100-ton low bed trailer is on order and is expected to arrive this month. It will haul freight along the relocate highway through the coulee. FACE LIFTING BEGINS—Work has already begun on removing the second story from the Northern Pacific depot at Coulee City. In two months it will be a stronger, modern building, ready to face a new era and play and important role in the building of the third powerhouse at Grand Coulee Dam. The Northern Pacific Railroad depot, built in 1884 (I believe this to be in error), is being completely rebuilt. The second story of the structure is being removed and the bottom floor is being strengthened and modernized. A seven-man crew headed by C. W. Phar has started the rebuilding job, which is not expected to be completed until about July 1. The demolition crew at work removing the second story of the old structure has removed hundreds of “square” nails, ranging from small shingle nails to some five inches long. The square nails date the building as one built prior to the turn of the century, when Coulee City was one of the outposts of the west. With only three freight trains a week running into Coulee City, what’s all the excitement about? It doesn’t take much figuring to assume that Northern Pacific is getting ready to handle the big bulk of material and equipment that will be necessary to construct the $400 million third powerhouse at Grand Coulee Dam. The legislation has now progressed so far in congress that it is considered a certainty to pass. With $3 million in preliminary engineering and construction funds included in the bill, the project should get underway soon after July 1. Northern Pacific is the only railroad that can serve the Grand Coulee area and its closest and best unloading point is Coulee City. The federal government still owns a shipping yard with unloading facilities two miles east of Coulee City. With heavy crane facilities, it is considered a certainty that this will be the principal unloading point for material and equipment that will be needed to build and equip the new powerhouse planned at the big dam. Giant generators and turbines will be coming. And it is estimated that nearly 5,000 carloads of cement will be required in the new powerhouse structure and dam alterations. During construction of the Grand Coulee Dam in the thirties, Northern Pacific ran a spur line to the dam. The track ran from Grand Coulee up the bottom of the Grand Coulee to the damsite. The old track bed now lies at the bottom of Banks Lake, the storage lake for water used in irrigating the Columbia Basin Project. The country between Coulee City and the damsite is so rugged that it is not considered feasible to construct another spur line. So most of the material and equipment will be trucked from Coulee City to Coulee Dam. This should create a new era of prosperity for Coulee City and the Northern Pacific. 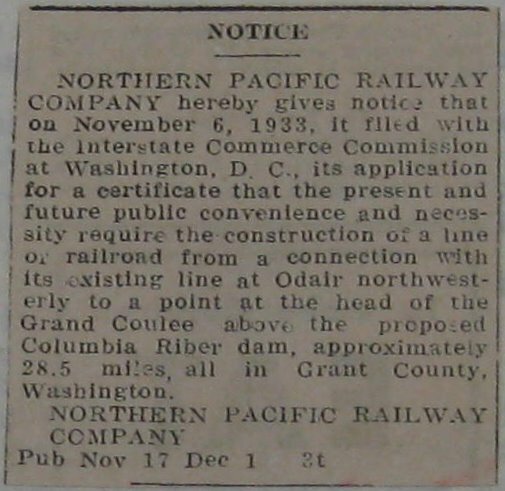 (p) Applicant (NP) is negotiating with the Great Northern Railway Company with a view to having the latter company share equally in the cost of construction and ownership of said proposed branch line of railroad, with a grant to the Great Northern Railway Company of trackage rights on the present line of the Northern Pacific between Adrian, Washington and Odair. In the event that some such contract arrangement is made between the two companies proper applications to this Commission for approval thereof and for the necessary certificates of public convenience and necessity will be made. Wenatchee. The train struck a mud slide and several cars were derailed. have drowned in the car. Ten passengers were injured, none seriously. last night. The eastbound train went out last night on time. that it will take three or four days to repair the damage. NP is also running trains over the OR&N between Spokane and Pasco. scheduled time when this last mishap occurred. Now that things have finally gotten rolling around here, I figured a name change is in order. It should help reflect what the point of all this is. It makes more sense than some old EMD locomotive type. The URL remains the same. Thanks to Robert at Oil Electric for inadvertently prodding me into the name change. The Northern Pacific "Ritzville Branch"
“The construction of this line was first considered more than fifty years ago, and it was under active consideration in 1909, 1910 and 1911. The first link in this line was what was known as the Ritzville Branch, which was a cutoff from our main line at Ritzville to Bassett Junction on the Connell Northern, which was under construction at that time. 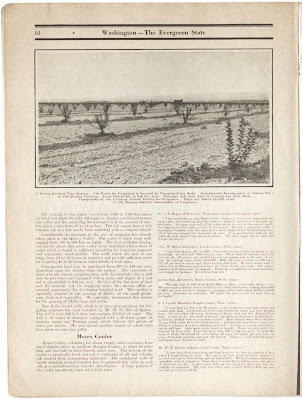 “The Connell Northern was completed in November, 1910, and we constructed a portion of the Ritzville Branch from Bassett Junction easterly to Schrag between August, 1909, and July, 1910. It was decided to construct this branch to main line standard so that it could become a part of the Ritzville-Ellensburg Cutoff and when the line from Bassett Junction to Ellensburg was completed. “During the next couple of years, consideration was given to various locations for the cutoff and the question of whether or not we should try and obtain trackage rights over the Milwaukee for all or part of the distance was under active consideration. By May, 1910, a definite location had been agreed upon and authority was given to start the acquisition of right-of-way. By July, 1910, business conditions did not have a very satisfactory outlook, and work was stopped on the Ritzville-Ellensburg line, as well as a number of other branch lines which were then under construction. “There was a fairly wide difference of opinion between Northern Pacific officers as to whether we should build our own line for the entire distance or use part of the Milwaukee line from the crossing of the Columbia River west to a point a short distance east of Ellensburg, but no conclusion was reached and our Operating officers were not greatly favorable to making a change from our existing main line because it would have necessitated the construction of additional freight terminals, and the net savings in dollars and cents for trains over the short line would have been relatively small, considering the fact that it would have required nearly $5,000,000 to construct the new line. From the above titled booklet published by the Great Northern. My source at the Bureau of Reclamation dates this photo as April 6, 1949. First seen here.